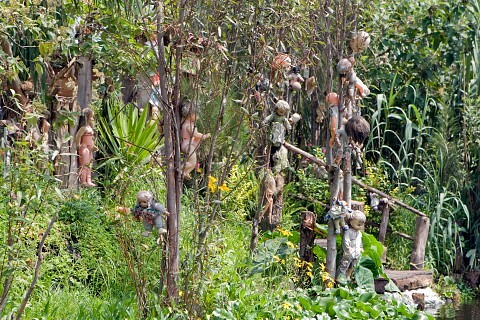 La Isla de Las Munecas or "Island of the Dolls" is an island situated at the Xochimilco Canals in Mexico. Judging by the pictures alone, one can start to have an uneasy feeling, an uncomfortable wondering, why are thousands of decrepit, decaying, bug-infested, broken, cracked dolls looming in the trees, on the fences, in the bushes of this island? Who put all of these dolls here and, for god's sake, WHY?! A man named Don Julian Santana Barrera was the only inhabitant and caretaker of the island. 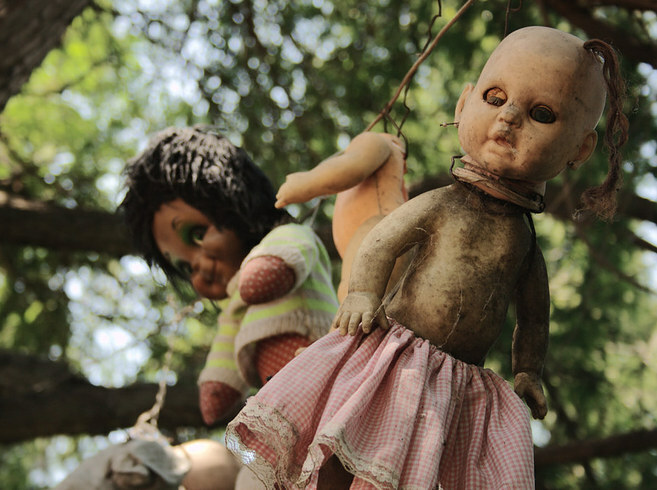 Legend has it, Julian was haunted by the spirit of a young girl who had drowned on the island and began collecting dolls and stringing them up in order to appease the young girl's spirit and bring her comfort. Some accounts say Julian had tried to save the girl's life and was grief-stricken he could not, thus resulting in her presence haunting him. Other accounts, including even Julian's family, say the girl had died before Julian even came to the island. It is difficult to get a clear story of what actually took place, especially since, you know, spirits are involved and such. Regardless, Julian became absolutely obsessed with the spirit of this young girl and began collecting dolls out of the canals and trash to hang up for the girl. Julian even sold his produce to locals in exchange for more dolls. Rather than cleaning up the dolls or attempting to fix them, Julian simply hung them as-is, cracked, decaying, dirty, glassy-eyed, soulless. 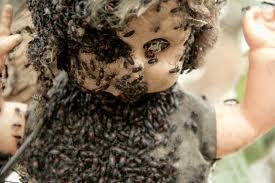 Even the dolls that arrived flawless were deteriorated over time due to the weather and wind. 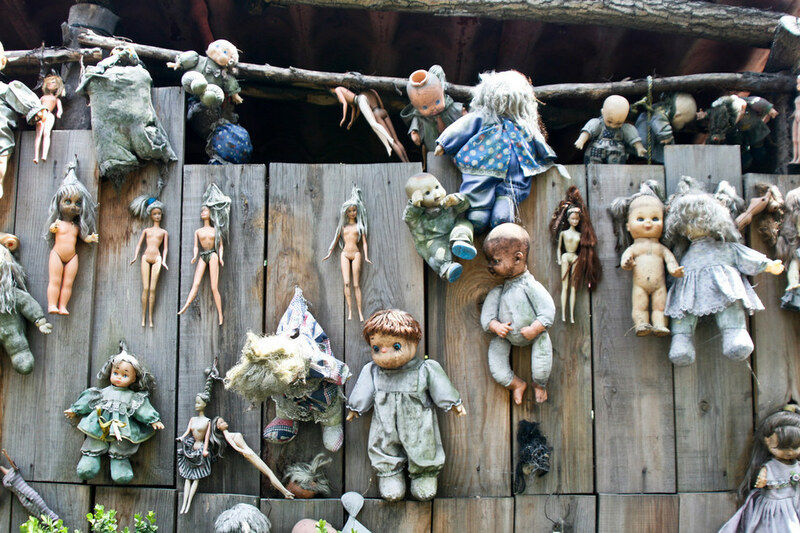 Julian kept his small cabin filled with dolls as well, adorning them with sunglasses, umbrellas, and other accessories. Julian had almost a strange sense of pride in his doll collection and would even give tours of the island, charging a small fee for visitors to take photos. An extra level of creep steps in where, after 50 years of inhabiting the island and collecting dolls, Julian's body was found in 2001 in the exact place where he believed the girl had drowned. Julian's legacy lives on though - the island has become a somewhat popular tourist attraction, being featured in TV shows and highlighted in articles. Tourists travel from far and wide to contribute their own dolls to the island, the collection ever-growing. Perhaps the spirits of both the girl and Julian now wander the island, surveying the dolls, strolling through the gardens, feeling a sense of peace for once.